I’M VERY HAPPY with my Disney obsession. I’ve met many wonderful people because of it. In 2001, while searching for discounts for one of our first Disney World vacations, I found a Disney message board. I learned a lot from reading it, and made good friends too. I’ve been posting on that Disney message board with the same friends for many years. We come from different parts of the world but share the same love of Disney. Some members drop off, and some new join, but our main friendships have lasted over a decade. Every time a couple of us get a chance to meet we tend to pick Cracker Barrel. We always ended up with a picture of us sitting in the rockers so it has now become a tradition. 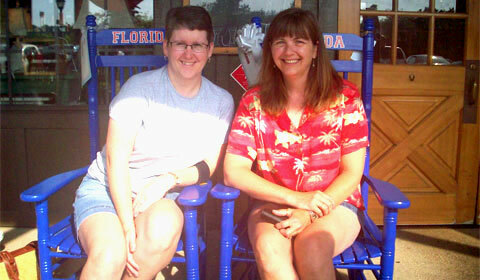 We met Ann for breakfast in St. Augustine, Florida on the way to Disney World and we did the traditional photo sitting in the Florida rocking chairs. Sometimes we meet in the Disney parks when we are going at the same time. 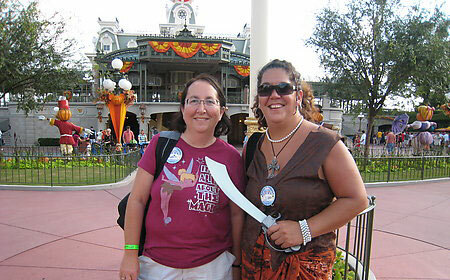 It’s wonderful to tour the parks and share the fun with another Disney World fan. 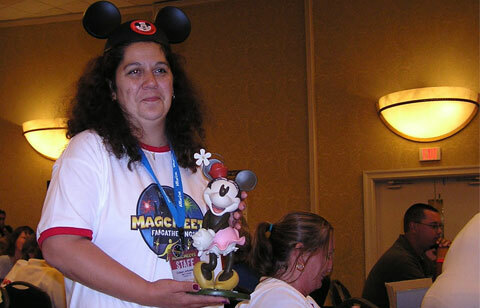 Special meets (Disney-themed conventions) happen around the world. The last meet we went to, we met with Disney friends Colleen and Andy. It was a fun and informative day. The back wall of the convention hall was filled with beautiful baskets that they raffled off to make money for the Make-A-Wish Foundation®. Participants checking out the baskets to be auctioned for "Make a Wish"
There were talks and seminars on everything from photography and scrapbooking to Disney’s internships and becoming a Cast Member. 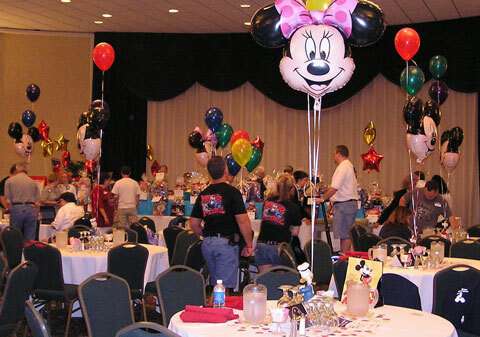 The hall was decorated with balloons, and every table had a prize to be won at the end of the day by a random drawing. Ours was a Minnie Mouse garden statue, won by Colleen. This was the perfect match for the Mickey statue she had back home. We have also met Dis friends outside of the Disney setting. 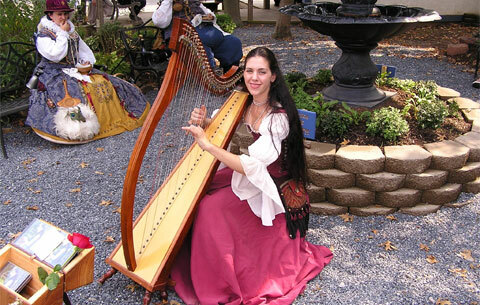 We first met Colleen when we went with her and her husband to the Pennsylvania Renaissance Faire. Another time Mike and I took a trip to Niagara Falls, Canada. 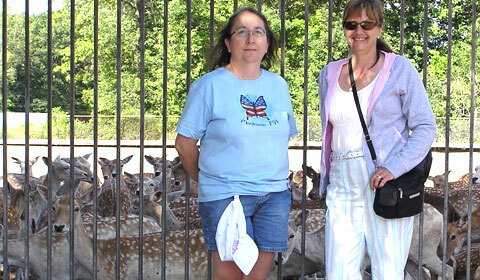 We met Robin and her daughter there and spent the weekend touring and enjoying each other’s company. It’s great to finally meet people you’ve been corresponding with for years. 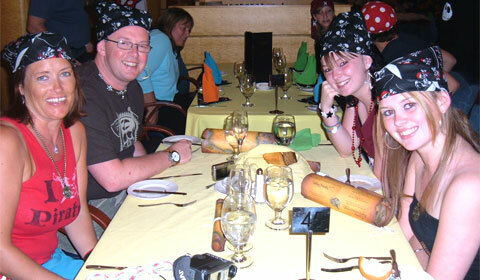 Our favorite gathering was a four-night cruise on the Disney Wonder in 2007. 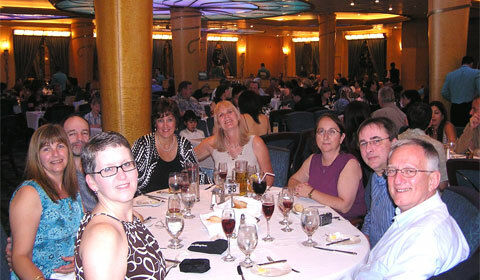 I’ve been on other cruises, but this was the most fun because we were able to share it with good friends. Feature photo (see top of story): The Disney Wonder docked at Disney’s private Island, Castaway Cay, Bahamas. They keep the Flying Dutchman docked here when it’s not being used for a Pirates of the Caribbean movie. Adventures Away! 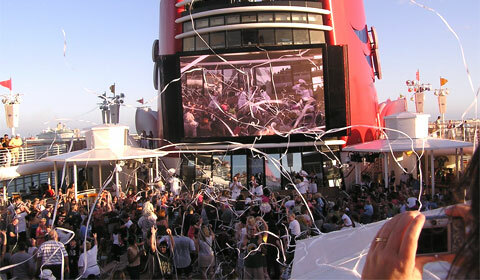 Sail-Away Celebrations on the Disney ships are the best way to start the cruise. Held on the main deck, there is lots of music and dancing. Cast Members offer beer and frozen drinks to the adults. Disney characters dance with the children, and everyone is in a party mood. 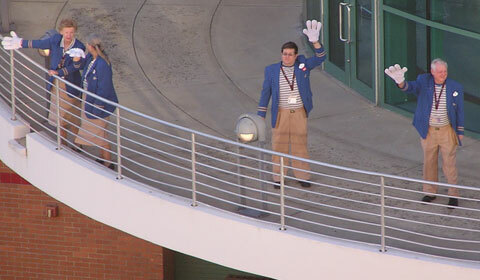 Standing at the rail of the ship as we start to sail out of Port Canaveral, we see the cast members at the cruise terminal waving goodbye with big Mickey gloves on their hands. Then we hear the ship’s horn blow its signature melody, “When You Wish Upon a Star” (my favorite part of sail-away), and we know we’re on our way to four nights of great fun and fantastic food. Cast Members from the terminal sending us off Mickey Mouse style! The Disney princesses love to meet the little ones. They do this in the atrium. There was Cinderella, Ariel from Little Mermaid and Aurora from Sleeping Beauty, among others. It’s so cute to see the little girls all dressed up in their finery, giving hugs or a pretty curtsey while they get their picture taken with their favorite princess. 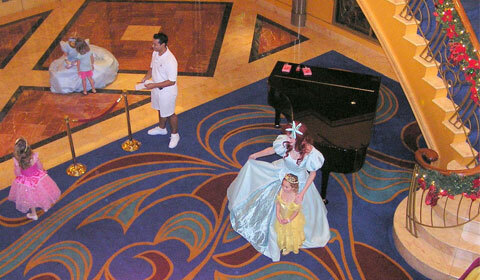 There are Disney characters all around the ship. While Mike and I were on the elevator it opened to show us Alice and the Mad Hatter playing hide-and-seek on the stairs and elevators with a couple of kids. They were all having such fun! One of the special nights is Pirate Night. It starts off with a pirate-themed dinner. 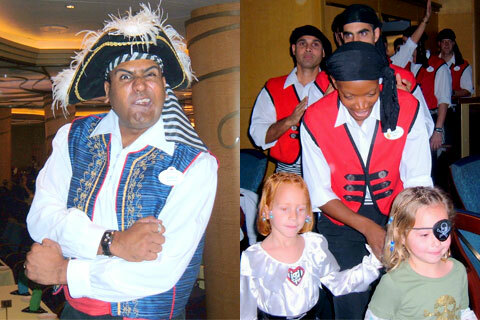 Guests are encouraged to dress as pirates, and the waiters do too. They even parade around the room with the kids just before they serve the last course. Then off to the pirate deck party, complete with fireworks. A neat thing I recommend is linking to each others’ reservations—that way everyone gets the same table and dining rotation. We had our days free to do whatever we liked, then met up for meals and evening entertainment. We all had daily adventures to talk about and had fun comparing notes and making recommendations for the next day. Every evening there was a Broadway-style stage show, with a Disney theme of course. They were well done and entertaining for all ages. 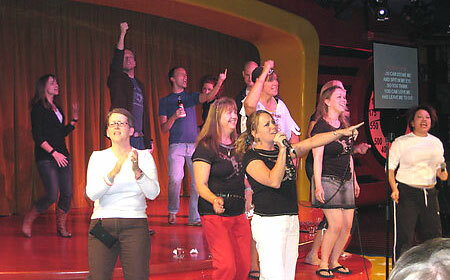 After the shows we would all meet up in WaveBands, a nightclub in the Route 66 entertainment area that offers family entertainment during the day but in the evening it’s adults only. It’s a very cool place, with vintage radios and hundreds of old records and albums covering the walls. There is dancing and karaoke and it’s great fun. The Disney Wonder has quite a few things offered for adults only. For instance, they have an adult pool area, and the Cove Café is a quiet place to read and enjoy a cup of coffee. One of the things adults can do is go to a brunch or dinner or even a high tea at their adult-exclusive restaurant called Palo. We booked the brunch with Robin and her husband. We had a relaxing meal, in a pretty dining room with full windows all around to watch the sea while you dine. The food offerings were wonderful, and I couldn’t possibly have tried everything offered. 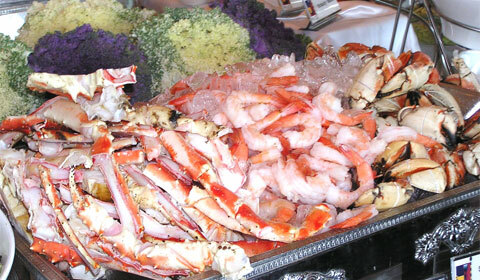 There were huge trays with assorted cheeses, pastries, fresh fruit, vegetables and antipastos, crab legs and jumbo shrimp. 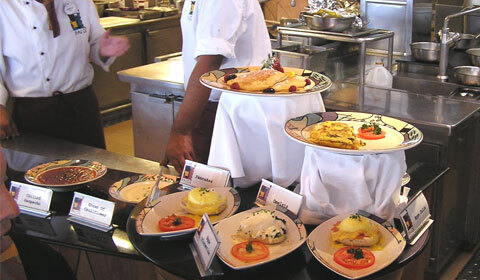 They have a station were the chef will make you a personal pizza to order—or omelets, pancakes, Eggs Benedict and many other choices. 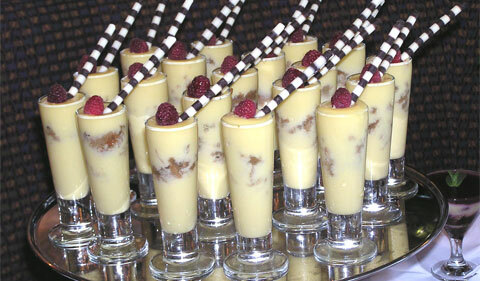 The dessert offerings were like a dream. They had beautiful creations, such as white chocolate slippers filled with glazed fruits, and bowls of chocolate mousse with confection swans sitting on top, along with all kinds of tarts, and parfaits. More then anyone could hope for. The extra cost of $10.00 per person was well worth it! 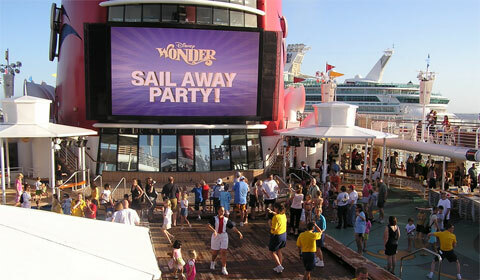 Mike and I will be taking another cruise with our Disney friends in 2012 on Disney’s newest ship, the Disney Dream. Maybe we will see you then too. It’s a wonderful way to meet up and make memories. Good friends and good times! * Disney message boards contain a great deal of info and there are many to choose from. A few of my favorites: DISboards, AllEars.net and INTERCOT. * It’s very true when people say “cruising makes your clothes shrink,” so pack a few things a size bigger than you normally wear. * Among the amazing facts about the Disney Wonder is its eleven gargantuan decks and its capacity to accommodate 2,700 passengers—along with 950 Cast Members and crew. * White Glove Destinations notes that magical portholes in the inside staterooms of the Disney Dream offer a real-time view of the outside of the ship. The Sorcerer Mickey suspended from the back of the Dream weighs about 2,500 pounds. * Disney Dream’s signature horn melody is “A Dream is a Wish Your Heart Makes,” but it’s the first Disney ship that can also play several different melodies. And the first ship to offer its own onboard water coaster, known as the Aqua Duck. You have always been “SOMEBODY” to me! One of my good friends that “Disney” gave me! What a GREAT article and SO much fun! I love that the DisBoard friends have met so much! I’ve been on 4 cruises with Rick & Robin….and I can’t wait for the next one! 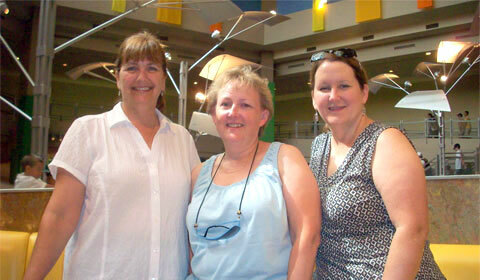 Thanks for such a FUN trip down memory lane and the information about the cruise line….. Going through the pictures for this article was a lot of fun. I didn’t know you went on that many cruises with Rick and Robin!Great! I am really looking forward to the next cruise too! It is a lot of fun and I feel blessed to have found Ann, and all my other Disney friends. Its a wonderful thing to be able to share the thing you love with the people who love it too, and whats not to love about Disney! Why just Imagine the fun? Join us next Aug, the more the merrier! Any cruise is just a booking away! Great article. It’s surprising to find out how much I have in common with other people just by talking about trips to Disney World. It’s also interesting to compare cruising experiences, Disney is better! I agree Disney cruises are better. Wonderful story and pictures. I loved the trivia about the Aqua Duck . . . watching the video makes me want to take my grandson down that slide! I’m looking forward to the Aqua Duck myself….and I wont have kids when I go…but I’m the biggest kid I know! We will meet someday too! This article really makes me want to take a Disney cruise! 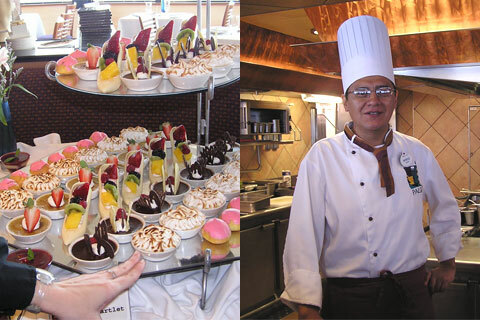 I can guarantee if you took a Disney Cruise you will not be disappointed. I would love to meet with you sometime. Great article. Sounds like fun. Thanks for posting this great article. We had such a fantastic time together onboard the Disney Wonder and also the many other times that we have managed to get together over the years. I love re-living everything in this article!.. Disney has changed my life, if for no other reason then giving me a great way to make some great friends. Cant wait for Aug. to see you all again!